Take A Journey Through the Kaslo Jazz Etc. Festival’s History! 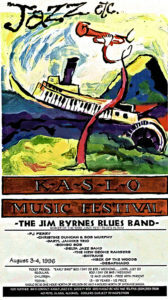 The Annual Kaslo Jazz Etc. Festival is now in it’s 27th year! We have put together a Festival Archive Page for you to journey back to beginning all the way through to now! It is a work in progress and will be continuously updated as we find more gems throughout the years to add. You’ll find posters, artist line-ups, photos, videos and more throughout the years! Enjoy the ride, we sure have! Click Festival Archive to journey into the past. 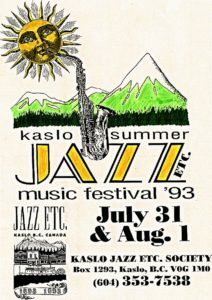 Kaslo Jazz Etc. Festival Merchandise 2018 Initial Artist Announcement!